Shrimp paste or shrimp sauce, is a common ingredient used in Southeast Asian and Southern Chinese cuisine. It is known as terasi (also spelled trassi, terasie) in Indonesian, ngapi (ငါးပိ [ŋəpḭ]) in Burmese, Dangpuithu in Mizo (Northeast India), kapi (กะปิ [kapìʔ]) in Thai, Khmer (កាពិ [kaapiʔ]) and Lao (ກະປິ [kapíʔ]), belacan (also spelled belachan, blachang) in Malay, mắm ruốc, mắm tép and mắm tôm in Vietnamese (the name depends on the shrimp used), bagoong alamang (also known as bagoong aramang) in Tagalog, haam ha/ha jeung in Cantonese Chinese and hom ha/hae ko (Pe̍h-ōe-jī: hê-ko) in Min Nan Chinese. The Chakma people from the Chittagong Hill Tracts of Bangladesh, who call it sidol, use shrimp paste extensively in their cuisine. It is made from fermented ground shrimp mixed with salt. 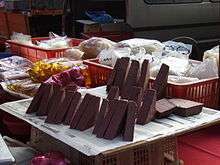 Some versions are in its wet form such as those in Vietnam and other versions are sun-dried and either cut into fist-sized rectangular blocks or sold in bulk. It is an essential ingredient in many curries and sauces. Shrimp paste can be found in most meals in Indonesia, Laos, Malaysia, Myanmar, Singapore, Thailand, Vietnam and the Philippines. It is often an ingredient in dip for fish or vegetables. The tradition to prepare shrimp, fish or seafood through fermentation is widespread in Southeast Asia; it can be found in Maritime Southeast Asia (Indonesia, Malaysia, the Philippines) to mainland Southeast Asia (Thailand, Myanmar, Cambodia, Laos, and Vietnam), and southern China to a lesser extent. Fermented fish or seafood is an ancient tradition in Southeast Asia, a similar tradition is demonstrated by Cambodian prahok, which is quite similar to the shrimp paste. In 1707, William Dampier described trassi (or terasi, Indonesian shrimp paste) in his book "A New Voyage Round the World"; "A composition of a strong odor, but it became a very tasty meal for the indigenous people." Dampier describe it further as, a mixture of shrimp and small fish made into a kind of soft pickles, salt and water, and then the dough was put in a clay jar tightly. The pickling process makes fish softened and become mushy. Then they poured arrack into jars to preserves them. "The mushy fish remains was called trassi," Dampier wrote; "The aroma is very strong. However, after adding a little part of it, the dish's flavour became quite savory." In the 1880s, trassi was described by Anna Forbes during her visit to Ambon. Anna was the wife of British naturalist Henry Ogg Forbes; the couple travelled through the Dutch East Indies in the 1880s. In her journal she describes the culture, customs and tradition of the natives, including their culinary tradition. Because of this foul-smelled ingredient, she accused her cook of trying to poisoned her and threw away that "horrible rotten package". Later she wrote: "Then, I observed each dish of the native or European, those that I have consumed since my arrival in the East contains this; the essence of that rotten stuff that has been used as a spice." Shrimp paste may vary in appearance from pale liquid sauces to solid chocolate-colored blocks. 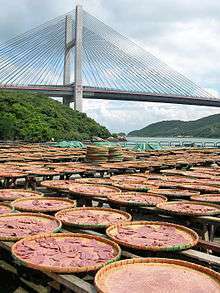 Shrimp paste produced in Hong Kong and Vietnam is typically a light pinkish gray; while the type used for Burmese, Lao, Cambodian, Thai and Indonesian cooking is darker brown. While all shrimp paste has a pungent aroma, the scent of higher grade shrimp paste is generally milder. Markets near villages producing shrimp paste are the best places to obtain the highest quality product. Shrimp paste varies between different Asian cultures and can vary in smell, texture and saltiness. Belacan, a Malay variety of shrimp paste, is prepared from krill, also known as geragau in Kristang (Portuguese creole spoken in Malaysia) or rebon in Sundanese and Javanese. In Malaysia, normally the krill are steamed first and after that are mashed into a paste and stored for several months. The fermented shrimp are then prepared, fried and hard-pressed into cakes. William Marsden, an English writer, included the word in his "A Dictionary of the Malayan Language" published in 1812. 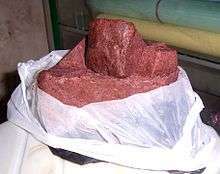 Belacan is used as an ingredient in many dishes. A common preparation is sambal belacan, made by mixing toasted belacan with chilli peppers, minced garlic, shallot paste and sugar and then fried. Sometimes it is toasted to bring out the flavour, but this process creates a strong odor. 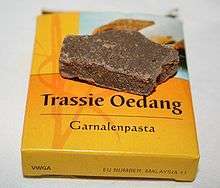 Terasi (trassi in Dutch), an Indonesian variant of dried shrimp paste, is usually purchased in dark blocks, but is also sometimes sold ground. The color and aroma of terasi varies depending on which village produced it. The color ranges from a soft purple-reddish hue to darkish brown. In Cirebon, a coastal city in West Java, terasi is made from tiny shrimp (Acetes) called rebon, the origin of the city's name. In Sidoarjo, East Java, terasi is made from the mixture of ingredients such as fish, small shrimp (udang), and vegetables. Terasi is an important ingredient in Sambal Terasi, also many other Indonesian cuisine, such as sayur asam (fresh sour vegetable soup), lotek (also called gado-gado, Indonesian style salad in peanut sauce), karedok (similar to lotek, but the vegetables are served raw), and rujak (Indonesian style hot and spicy fruit salad). Bagoong alamang or "Ginamos" (in Western Visayas) is Filipino for shrimp paste, made from minute shrimp or krill (alamang) and is commonly eaten as a topping on green mangoes or used as a major cooking ingredient. Bagoong paste varies in appearance, flavor, and spiciness depending on the type. Pink and salty bagoong alamang is marketed as "fresh", and is essentially the shrimp-salt mixture left to marinate for a few days. This bagoong is rarely used in this form, save as a topping for unripe mangoes. The paste is customarily sauteed with various condiments, and its flavour can range from salty to spicy-sweet. The colour of the sauce will also vary with the cooking time and the ingredients used in the sauteeing. 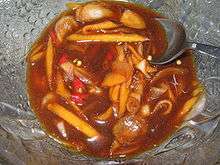 Cincalok is the Malaysian version of 'fresh' bagoong alamang. Hae ko means prawn paste in the Hokkien dialect. It is also called petis udang in Malay and Indonesian. This version of shrimp/prawn paste is used in Malaysia, Singapore and Indonesia. In Indonesia it is particularly popular in East Java. This thick black paste has a molasses like consistency instead of the hard brick like appearance of belacan. It also tastes sweeter because of the added sugar. It is used to flavour common local street foods like popiah spring rolls, Asam laksa, chee cheong fan rice rolls and rojak salads, such as rujak cingur and rujak petis. 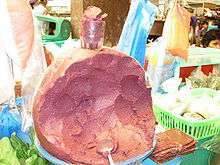 In Chittagong Hill Tracts, shrimp paste is called "Sidol", "Nuppi" by indigenous Jumma people. They use it to make vegetable food, such as bamboo shoots curry. In Chittagong Hill Tracts, Bangladesh, Bamboo shoot curry is a traditional food of the indigenous Jumma people. They eat it by this way, at first bamboo shoots are collected from bamboo forest, then defoliated and boiled in water. After then boil some water mixed with shrimp paste, put some chilly and garlic paste and salt, flour on the shrimp paste mixed water. Then give heat the mixture. After a few minutess later put the boiled bamboo shoots on the mixture and keep heating; after some minutes, the food is ready to serve. ↑ "Mam Ruoc - what is this Vietnamese sauce?". Retrieved July 11, 2011. 1 2 3 Su-Mei Yu. "A Lamentation for Shrimp Paste". Gastronomica, the Journal of Critical Food Studies. 1 2 Mahandis Yoanata Thamrin. "Terasi dalam Catatan Perjalanan Pelancong Terlawas". National Geographic Indonesia (in Indonesian). Retrieved 24 September 2015. ↑ "TERASI - (Dried Shrimp Paste)". Retrieved July 11, 2011. ↑ Marsden, William (1 January 1812). "A Dictionary of the Malayan Language". Cox and Baylis – via Google Books. ↑ "3 Easy Ways to Roast Belacan (Dried Shrimp Paste)". ↑ Pierson, Stephanie (4 October 2011). "The Brisket Book: A Love Story with Recipes". Andrews McMeel Publishing – via Google Books. ↑ Eats, Serious. "An Intro to Malaysian Food: The Ingredients". ↑ In Western Visayas, shrimp paste or "ginamos" is prepared in a very similar way as in other Southeast Asian nations. In Iloilo, especially in Banate (famous for this delicacy), the minute shrimps or "hipon" are salted, dried under the sun, and then grounded. ↑ "Shrimp Sauce / Paste". Retrieved July 11, 2011. ↑ "Food & Recipes - Asia Society". ↑ "Shrimp Paste – Gkabi". Retrieved July 11, 2011. ↑ "Dried shrimp paste". Retrieved July 11, 2011. ↑ "How Shrimp Paste is Made". Retrieved July 11, 2011. ↑ "Shrimp Paste". Retrieved July 11, 2011. ↑ "Ethnic Cuisine: Indonesia". Retrieved July 11, 2011.